The darkness invading the world of Konami�s Yu-Gi-Oh! Trading Card Game reaches its pinnacle with the May 25 release of the Dark Saviors booster set. Dark Saviors features classic monsters and new deck themes designed to appeal to both new and experienced players. The 60-card set includes vampires that can enslave opposing monsters, skyfaring demihuman swashbucklers, and a heavily-armored heroine equipped with high-tech flying power armor that can be geared up with special weapon modules. The cards in Dark Saviors are intended to combo well with cards from Konami�s other upcoming dark-themed releases, including April�s Lair of Darkness Structure Deck (see ��Yu-Gi-Oh!� Heads Into �Lair of Darkness��), May�s Flames of Destruction booster set (see �The �Flames of Destruction� Are Heading for �Yu-Gi-Oh! TCG��), and June�s Flames of Destruction: Special Edition boxed set (see ��Yu-Gi-Oh! Flames of Destruction: Special Edition��). The 60 cards in the set includes 40 Super Rares and 20 Secret Rares, and each booster will include five foil cards. Boosters will be sold in 24-pack display boxes. 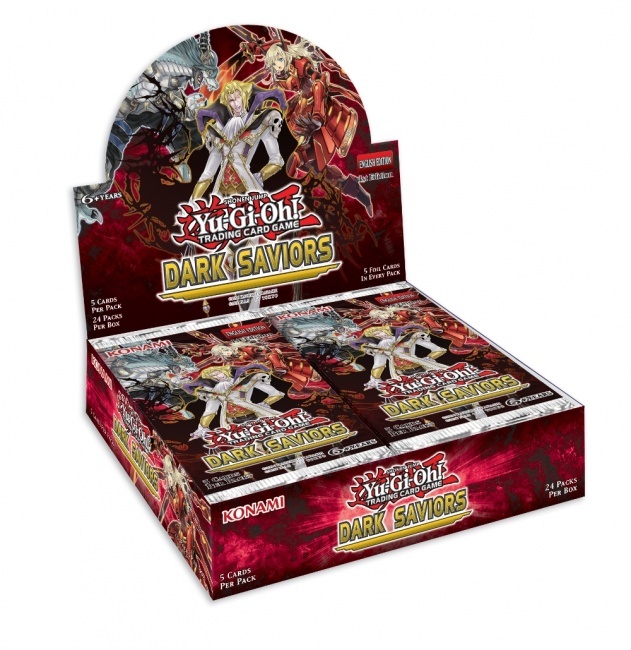 Dark Saviors will release during Konami�s Lost Art Promotion (see ��Yu-Gi-Oh!� �Lost Art Promotion�!�).